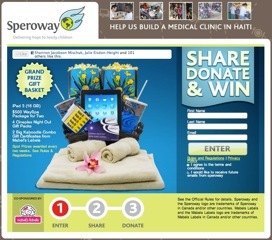 Help Speroway Build A Medical Clinic in Haiti & Win! I was recently introduced to a really great organization - Speroway (formerly "Feed the Children - Canada"). They have a great contest going on right now where you could win an iPad HD, but more importantly they do amazing work in Haiti and here in Canada. FEED-A-CHILD - Look into the face of a hungry child and you’ll see a child with real hopes, real fears, and a very real need to eat. From areas devastated by natural disasters to countries caught in the grip of poverty, countless hungry children need help! CHILD CHAMPIONS - Reach into the life of a child through our child sponsorship program and become a “Child Champion”. You can impact a child’s life forever. Every child deserves basic necessities like food, medical care, and education. Changing a child’s future – can you think of anything more important? MEDICAL TEAM - We seek your continued support for our medical teams. This program provides medicines and vitamins in its mobile clinics, along with food and other supplies. Assistance is also required in shipping containers of food, medicines and other life-saving essentials to overseas locations. FIRST NATIONS - High unemployment rates and an extremely high cost of living results in First Nations communities in Northern Canada living in poverty. This can be unreasonably difficult for First Nation children who simply want to have a good meal everyday. ABANDONED BABY CENTER - A baby’s feverish eyes show the suffering. Ragged breath points to pneumonia, tuberculosis or worse. The agony of slow starvation is heartbreaking, and every day babies like this are orphaned or abandoned in Kenya. They are innocent victims and their needs are urgent! FOOD DROPS - We gather food from over 110 procurement partners and other generous groups and put together a 25+ pound box of food – enough to provide a child a meal a day for 7 days. Food drops are a tangible way to put our mission into action and to provide a helping hand to people in communities across Canada. SPECIAL PROJECTS - You can make a difference for hungry children by organizing a Special Project Fundraiser. These projects are a fun and fulfilling way to take a stand against hunger with Speroway. Speroway is trying to raise awareness about their new name, new website, new facebook page, and of course their amazing programs. They also want to build a medical clinic in Haiti. In order to get people's attention they are having a contest. Other prizes will be awarded every two weeks. This "Share and Win" contest is open to all of Canada (except Quebec) and ends June 22, 2012. See the rules and regulations for details. Do something good today- support Speroway!